If you are in the Bristol area then you can catch my work in a couple of places. I’ve got five pieces at the Clifton Arts Club open exhibition which closes this weekend 19th August. You can catch both of my Clifton in the snow Beast From the East paintings. I painted back at Easter along with a couple of warmer Cornish seascapes. I’ve submitted work into the Clevedon Open Exhibition which has a private view to kick it off tomorrow night (Friday 17th August). Hopefully I’ll have got some more landscapes in there too! (Including a snowy Portishead one). Get along and take a look, especially if you like looking at snow in the middle of Summer!!! Clifton closes Sunday at 1:30pm, so hurry. Clevedon runs until the 27th of August. Almost forgot to mention more exciting news. I’ve been selected as Mr April in the Bristol Impressions Calendar. I’m really chuffed about this having had one on my wall most years since tentatively starting to paint. So I was really pleased when the team there selected me to join their elite ranks. Thanks! This morning I got set up for the NSA #65 show in Nailsea, this evening I looked around the venue for the BS9 art trail at Elmlea school and lunchtime I found out I’ve had a painting selected for the New English Art Club for the first time EVER. Come and celebrate the post hump 2018 with me at the private view of the NSA exhibition #65 on Friday (13th April). Ignore the fact it’s Friday the 13th and get out from under your duvet, it’s all downhill from here, see you there. I’m particularly excited about finally getting a piece into the NEAC show at the Mall Galleries. One of the first “proper” artist’s I met was the marvellous Dawn Sidoli NEAC RWA who has always been overwhelmingly supportive of my efforts over quite a large number of years of no NEAC luck, so I’m relieved to feel I’ve rewarded her faith. “Work by a local artist has been selected from over 1,600 entries to appear alongside paintings by some of Britain’s leading figurative artists. The New English Art Club’s annual exhibition is on display at Mall Galleries in central London between 15 and 23 June 2018. Its Annual Exhibition is a showcase for members and gives aspiring artists an opportunity to exhibit alongside some of the best figurative artists working today in painting, drawing and printmaking. Some of the “richness and variety” in my selected work was added by it being blown off the easel and rolling down the slope leaving all sorts of exciting vertical marks which I embraced. The show in Bath is still on until Mid-May, get along if you can, it’s a cracker. I’m not a great fan of those round robin Christmas letters so I’m writing this with some trepidation. However 2015 has been a year of some progress so I thought it would be worth reminding you of news and any earlier posts you might want to look back on by clicking the links. It was a year of two (unequal) halves a flurry of painting followed by a cycle of exhibiting. I began the year by doing quite a bit of plein air painting and went on a course at Newlyn School Of Art with Paul Lewin. The course as well as being enjoyable was also an encouragement to loosen up with mixed media. With hindsight I haven’t taken this as far as I anticipated but it was certainly an inspiration to be looser when painting outside. This flurry of activity was mostly to get things to hang on the wall for North Somersets Arts Week. Once again it was great fun to have people coming through the house and I managed to raise £200 for Black Nore lighthouse by selling cards and Helen’s marvellous cakes. The other main painting event of the year was the Andrew james portrait course which I’ve organised for a few years now and was a great success again fuelled by more of Helen’s cakes. I get a free course out of it and am still pretty pleased with my portrait of Viv. Viv Detail with brush used. I spent the rest of the year (well apart from life classes) punting these paintings around various juried exhibitions the highlights being the RWA in Bristol and the ING and rubbing shoulders with the Royal Institute of Oil Painters for the first time in London. I’m especially grateful to the judges of the Clifton Arts Club Open for awarding me the prize of excellence (which also doubled as my entry for the ROI). Thanks to Trevor Haddrell RWA, Ione Parkin RWA and Ros Cuthbert RWA, what. a discerning trio. People ask about my organisation and preparation but it all boiled down to this little scrap of paper I used for shepherding my meagre resources and time, so it’s all smoke and mirrors really. If you can read my handwriting you’ll see there are some misses among the hits so still plenty to aim for in 2016. The Masterplan! (the only plan). I mentioned not freeing up as much as I wanted and I am looking forward to a return trip to Newlyn for a course focussed squarely on abstract painting in March. I’m obviously hoping that 2016 will bring as much pleasure as 2015 but to be honest if it brings as much I’ll be surprised and very happy. Thank you very much for taking an interest and I hope 2016 is a successful year for us all. I feel so lucky to have got into the Royal Institute of Oil Painters and be back at the Mall Galleries so soon after the ING exhibition. I went to the private view yesterday and it felt very grown up.The ING was a real range of ages and styles, here at the ROI were serious, established oil painters, faces familiar from all those painting DVDs, painters of serious oil paintings, no playful modernism here. 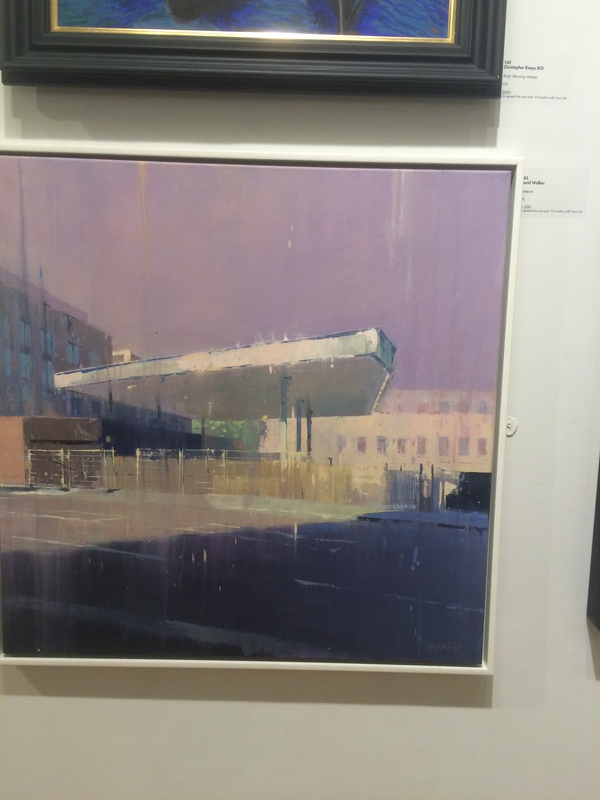 It was a great chance to meet some Twitter acquaintances in real life too including Andrew Farmer who was the runner up for the W&N Young Artist prize, surely being young enough to be categorised as a young painter is reward enough? 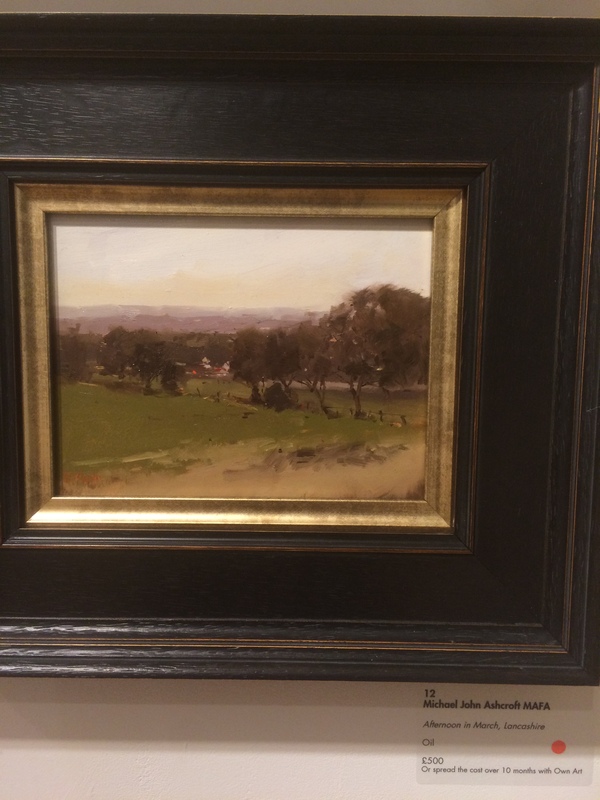 The selected painting was the prizewinner from the Clifton Arts Club exhibition from the Summer. Here it is (and me) hanging out with (under) a Lachlan Goudie painting (off of the telly). 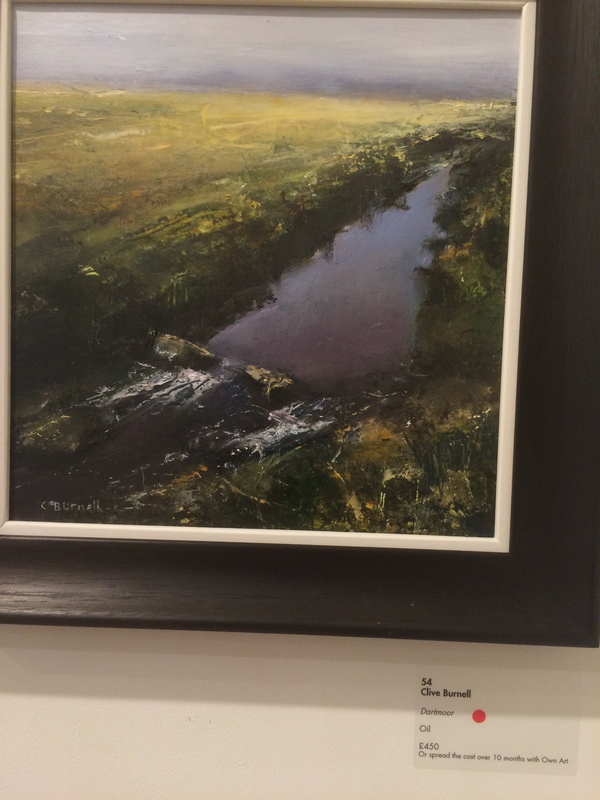 Here are a couple of paintings from the work on show that caught my eye by David Walker, Clive Burnell and Michael Ashcroft as well as work by Mo Teeuw which I didn’t snap, given the terrible photos below this is no bad thing. It runs until the 13th of December 2015 and admission is £3. If you get a chance to go then do take advantage of the great location by visiting the National Galleries off Trafalgar Square as well. On a random wander I found a painter called Boltraffio near some humbling Moronis. The snap doesn’t do the quality of the modelling and colour justice. Also go and visit the Taylor Wessing Photographic Portrait Prize at the National Portrait Gallery. Amongst the refugees and bleak locations this portrait “Norma” caught my eye, there as a counterbalance to the negative representation of older people in the media. If you get a chance go and enjoy any or all of it.